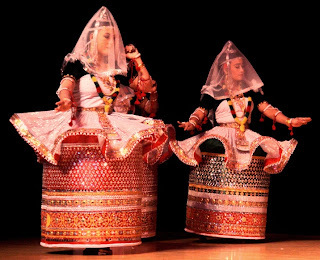 Manipuri dance - is a traditional dance form of Manipur, India. It is one of the seven (7) classical dance forms of India, the others being Bharata-natyam, Kathak, Kathakali, Kuchipudi, Orissi and Satriya. This dance style was originally known as 'jagoi' which means circular movement. It was known to be compared to the movement of the planets around the sun. The Manipuri Dance essentially centers around 'Krishna Bhakti'. The dance is typically a celebration of the 'Radha-Krishna' relationship. It is strictly religious. The cult of Radha and Krishna, particularly the 'raslila', is central to its themes but the dances, unusually, incorporate the characteristic cymbals (kartal or manjira) and double-headed drum (pung or Manipuri mridang) of 'sankirtan' into the visual performance. The musical accompaniment for Manipuri dance comes from a percussion instrument called the 'Pung', a singer, small cymbals, a stringed instrument called the 'Pena' and wind instrument such as a flute. The dance greatly embodies delicate, lyrical and graceful movements. The aim is to make rounded movements and avoid any jerks, sharp edges or straight lines. It is this which gives Manipuri dance its undulating and soft appearance. The dancers use hand movements and facial expressions to narrate stories from the myths and epics of India. The foot movements are viewed as part of a composite movement of the whole body. From the religious point and the artistic angle, Manipuri dance is claimed to be one on the most important, humble, gentle, mild and pleasant dance styles of the world. The style is also considered as one of the most meaningful dances of the world. The dance became popular among the people of the world mainly for people like Rabindranath Tagore, Guru Senarik Singha Rajkumar and Guru Nileshwar Mukharjee. Rabindranath Tagore (poet) was a great supporter of the Manipuri dance. 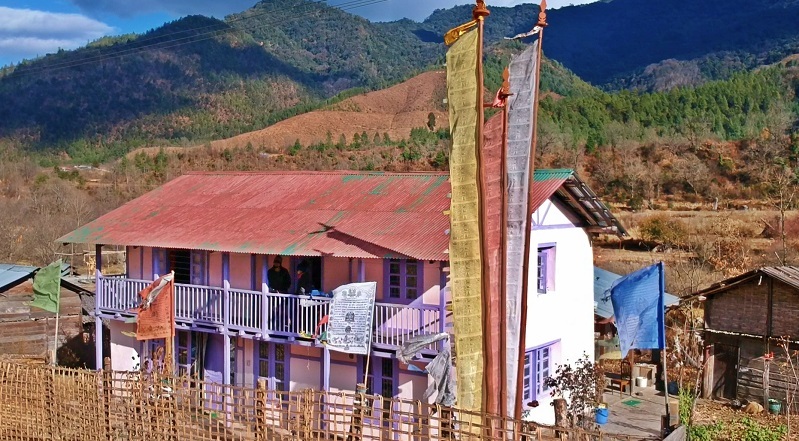 Because of his love for the dance, in 1920 he opened a new department of Manipuri Dance in 'Shantiniketon' (Shantiniketan - a university town also known as Visva-Bharati University founded by Rabindranath Tagore) in Calcutta. And for this effort of Tagore, the Manipuri dance, within a decade, crossed its regional and national arena and became a popular and reputed international style.